Modern marketers live in a world that’s dominated by data. Advancements in programmatic buying enable marketers to leverage data and analytics to connect precisely, in real time. Advertisers who are smart about organizing, segmenting, and acting on this data are realizing the benefits of more personalized marketing. BT, a leading telecommunications firm in the UK, did just that and saw fantastic results. BT wanted to increase the relevance of their remarketing campaigns by creating more precise audience lists. With the help of their media agency Maxus, BT found that using Google Analytics Premium with DoubleClick Bid Manager offered the ideal solution. Google Analytics Premium gave BT the ability to create granular audience segments based on site behavior metrics such as recency, frequency, referral source, and stage of cart abandonment. Once these audience lists were created, the native integration between Google Analytics Premium and DoubleClick Bid Manager meant they could be shared with the platform to make more precise media buys in just a few clicks. 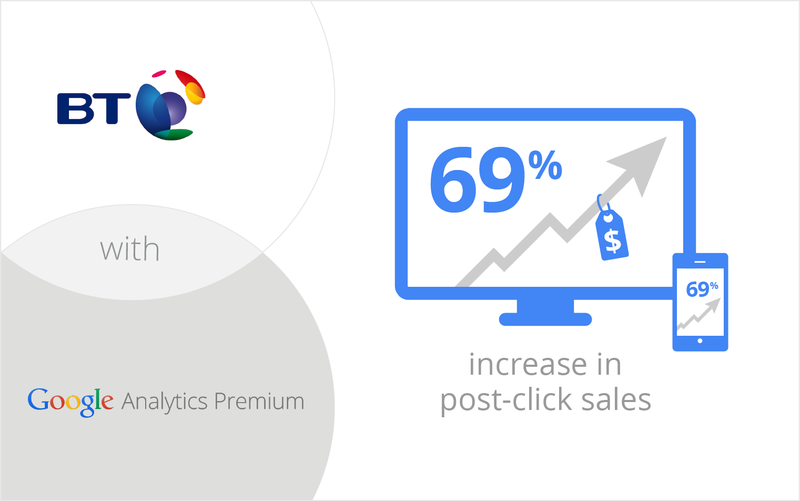 Using Google Analytics Premium with DoubleClick Bid Manager put Maxus and BT in the driver’s seat of their media campaigns. They not only gleaned full transparency with a single customer view and de-duplicated metrics across all channels, but also saw better measurement through unified reporting, and the ability to optimize based on the results. The new analytics-driven approach produced a 69% increase in post-click sales and an 87% reduction in post-click cost per acquisition compared to the previous year’s remarketing activity. It also compared favorably to the remarketing activity that ran simultaneously outside of DoubleClick Bid Manager; post-click sales were 30% higher and post-click cost per acquisition was 42% lower. BT has now consolidated its display remarketing through DoubleClick BidManager.